Nifty’s 10K run - What to do now? Nifty took ~9 years to reach 2000 mark in December 2004, after that in merely ~3 years it reached 6000 mark in December 2007. Then, it took another ~6 and a half years to climb the next 1000 points because of 2008 crisis. In next ~3 years it reached 9000 in March 2017 and thereafter in just ~4 months it touched the 10K mark on July 25, 2017. 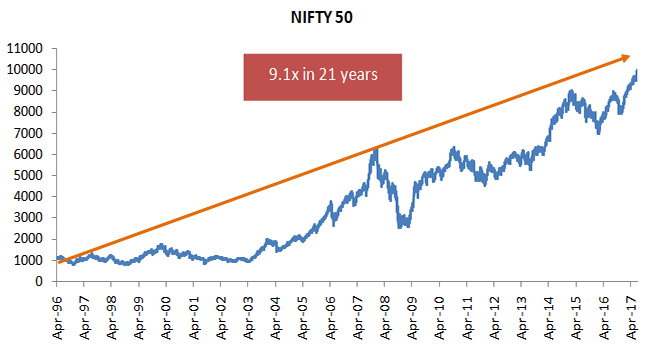 The Nifty 50 has given a return of 9.1x in just 21 years since its launch date, April 22, 1996. July 25th 2017 was a historic day in the history of Indian financial markets as the Nifty 50 touched the 5 digit number for the first time. It was a very significant psychological mark and brought cheers on the faces of market participants. But cheers are not without fears. Many analysts are trying to decipher where the market will go from here. 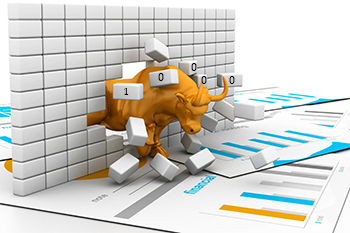 Some are optimistic that the market will make new highs while some are arguing that the market is expensive and will correct, and some are making a case of consolidation at current levels. In our view, market may consolidate at current levels for the time being before restarting its journey to make new highs. Let’s see why we believe that this is how things will turn out. To start, we list below the factors that have got us to where we are. Acceleration in Reforms: Recent reforms have further cemented the growth story of India in a timid world economy. With the strong BJP government at the centre, the pace of the reforms have picked up after the landslide victories in state elections. In medium term the economy is expected to strengthen further given the reforms momentum undertaken recently like Goods & Services Tax (GST) and Bankruptcy code. In future we are expecting some tougher reforms in Land and Labor to be tabled. Benefit of Reforms yet to be Reaped: The reforms like housing for all, agriculture reforms, power sector reforms, Direct Benefit Transfers (DBT), GST and bankruptcy code will show their true benefit in coming years. Housing for all by 2022 will create million of jobs, the reforms in agriculture will reduce the supply side bottlenecks and contain food inflation, power sector reforms will reduce the electricity cost for corporates, DBT will reduce the slippage of subsidy, GST implementation will improve the ease of doing business and increase the tax collection, and bankruptcy code and NPA resolution will improve the financial health of Banks. 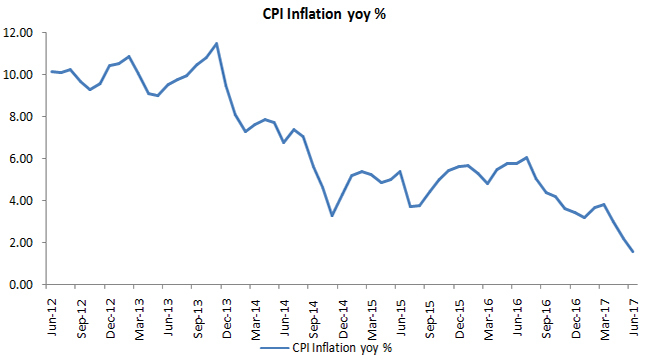 Subdued Inflation: The inflation has come down sharply to multi year lows; in June 2017 the yearly CPI inflation declined to 1.54%. The improvement in supply side bottlenecks and prudent increase in minimum support price have curtailed the inflation. The softness in international commodity prices has also helped RBI to achieve its inflation targets. Going forward, inflation is expected to be contained in the comfort range of RBI as the government is continuously working on removing the supply side the bottlenecks while being assisted by subdued commodity prices. Low Crude Oil Prices: The nosedived slump in the crude oil price has changed the fortune of India by saving ~ Rs 1 trillion annually, improving current account deficit and fiscal deficit, and controlling inflation. The situation is expected to remain benign for India in the near term as well. Recovery in Corporate Earnings: The five year period from FY12 to FY17 witnessed subdued earnings growth of Indian companies. However, in next 2 years we are expecting a sharp rise in earnings growth at ~18-20% CAGR, mainly due to declining interest cost, improving business environment and lower base. 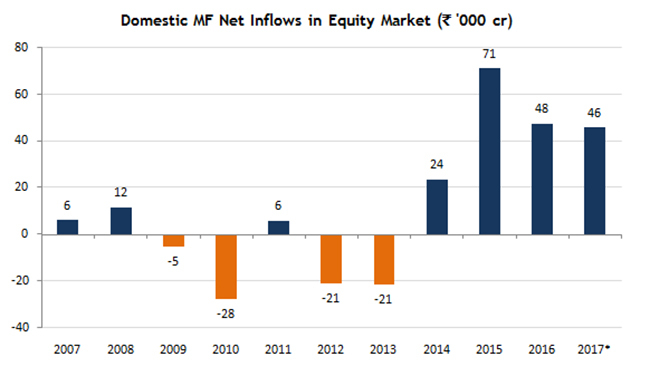 Domestic Saving Flows in Equity: The AUM of domestic mutual fund industry has reached ~Rs 19.9 lakh crore, a growth of more than 3 fold in a span of 5 years due to robust inflows, particularly via SIPs. In last 1 year, the average SIP inflow was ~Rs 4000 crore per month. Backed by the robust inflows in mutual funds schemes, domestic mutual funds have poured ~Rs 45,681 crore in equity market in first 7 month of 2017. Normal Monsoon: The normal monsoon in 2017 is expected to boost the consumption and will help in keeping the inflation calm. This will give a fresh leg to the current rally. The factors mentioned above point to the only logical interpretation – that the Indian economy is poised to continue on its current growth path. India is expected to keep the tag of the fastest growing economy in the world despite the disruption of Demonetization and GST. According to IMF, India is likely to grow at 7.7% in next year compared to 3.6% for the world. Will the markets follow in the same direction? In the long-run, Yes, but in the short-run, they may consolidate around the current levels. Having given ~24% return in 2017, that’s not necessarily a bad thing. What to do with existing portfolio and SIPs? So far we’ve seen why Indian economy is on a roll and the factors that are expected to continue the good times for the economy and the market. Let’s look at what you as an investor should do at such a time. Invest in stocks with higher probability of upside: As the Nifty 50 has already given ~24% return in 2017, we expect the market to consolidate in the second half of the year at current levels. Thus, we recommend investors to invest in stocks with higher probability of upside rather than investing in stocks which have higher upside with lower probability. IIFL research recommends a play on the affordable housing initiative of the Government. Continue to SIP: Mutual fund investors investing via SIP should continue to invest as even if there are some temporary corrections in the market, they will get more units leading to higher values once the bull run resumes. Mutual Fund SIP delivers good returns if the investment period is fairly long. Continued investing through various ups and downs helps average out the cost per unit over a period of time. The growth story of India in intact due to strong macroeconomic factors and ongoing reforms. However, the US Fed and ECB can sour the mood of the market by unwinding the stimulus. But in their recent commentary, they stipulate the gradual interest rate hikes. Thus the real party is yet to start, so remain invested. Below are some of our recommendation on stocks and mutual funds. GIC HF is likely to see a decent growth in its loan book on account of its focus on Low Income Group (LIG) customer segment. GIC HF is available relatively cheaper at ~2.0x on FY19E P/ABV despite higher earnings potential compared to its peers. Century Plyboards (CPBI) is expected to benefit due to its leadership position in the organized plywood market (~25% market share) and being the 3rd largest player in the laminates market (~12% market share). The expansion into laminate capacity (~50% capacity expansion) and foray into MDF at an opportune time will provide next leg of growth and would improve its cash flows. We expect it to register ~25% earnings CAGR over FY17-19E. Prism Cement (PCL) is present in cement, tiles, sanitary ware, bath fittings, kitchen fittings and RMC business. Increase in demand for affordable housing will help improve demand in these segments; additionally, cost reduction measures will improve PCL’s cash flows. We forecast an earnings improvement from ~0.1/share to ~7.0/share over FY17-19E. 1 year returns are absolute; Returns greater than 1 year are CAGR.